There are people in my life who are my go-to sources of conversation for specific topics. When I feel the need to talk about animation, kids movies, drawing, writing, or anything art-related, Jason is that person. Last year, he participated in Inktober. 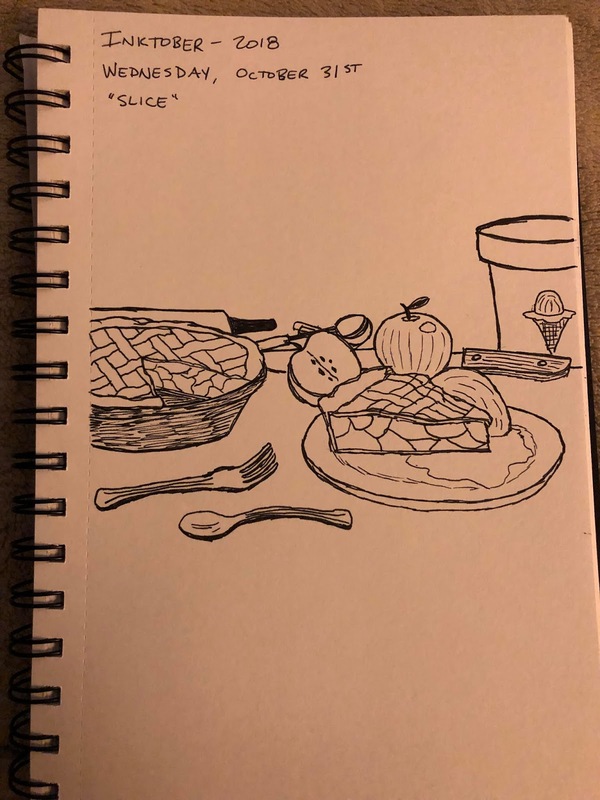 Inktober is a celebration of art, an artistic challenge, and a call to the artists within each of us to develop a drawing a day based on a suggested prompt for each day of October. Jason's Inktober manifested itself on a small white board with dry erase markers. I wanted in. This September, he reminded me of the pending challenge and I jumped aboard. I grabbed a new drawing pad and my standard sketching device (my favorite pens - Pilot Precise V5s) and started drawing. Thirty-one days, prompts, and drawings later, we have the completed Mike Flick version of Inktober 2018. As an engineer working in the transportation industry at an engineering company surrounded by a bunch of engineers, I embrace the opportunities to massage the right side of my brain and Inktober was a perfect avenue for the corralled creativity inside me. I had a ton of fun trying to imaginatively address the prompt for the day and challenging myself in areas that I struggle with artistically (mostly drawing people). As the month progressed, I found myself excited with prompts that forced me to find a new angle to develop the concept. I also found myself having to accept what I considered imperfections in my work through the permanence of the pen and adjusting accordingly. The month was cathartic, providing confidence in self and an outlet to decompress from the daily stresses of life. Thanks to each of you who provided positive feedback and for all of you who came along for the ride. Next year, you should join me.